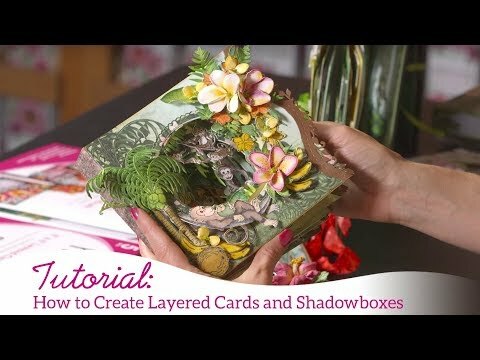 Watch Emma Lou's video for techniques to easily create a shadow box watch this video. 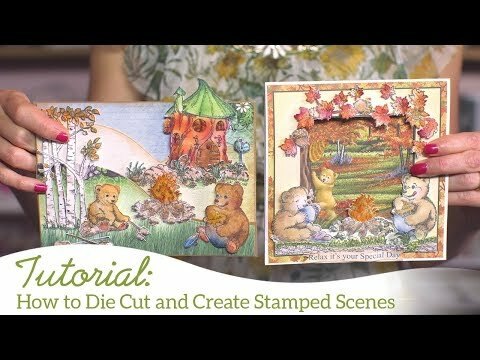 For more ways to use the Beary Retreat collection see this video. Watch this video for tips on shaping the sunflowers. Instructions: Assemble the 6 x 6" shadow box. Trim a piece of patterned 6" x 6" panel. Use a stamp positioner to stamp the sentiment in Tuxedo Black ink and then adhere the panel to the back of the box card. To make the trees stamp the images from the HCPC-3766 Woodsy Treescape Stamp set with Tuxedo Black on white cardstock. Sponge the leaves with a combination of Canteloupe, Bamboo Leaves, Tangelo, and Morocco inks using the sponge daubers. Use the Dove Blender pen to colour the trunk of the large tree with Flannel Grey ink, and the smaller trees with Espresso Truffle ink. Die cut with coordinating dies. Shape the trees with the Deluxe Flower Shaping kit and adhere to the back of the card. Stamp the leaves from the HCPC-3766 Woodsy Treescape Stamp set with Tuxedo Black ink on white cardstock and sponge with a combination of Canteloupe, Bamboo Leaves and Morocco inks before die cutting with the coordinating die. Place the large tree on the front left of the shadow box. Place the trees in the centre of the card as shown. Shape and adhere the leaves to the top left corner and on the tree trunk as shown. Stamp the bears from the HCPC-3797 Beary Fun Retreat Stamp set with Tuxedo Black ink on white cardstock. Colour in with Butter, Potterís Clay, Rich Cocoa, Summer Sky and Canteloupe inks with the daubers and die cut using the coordinating dies. Shape and adhere to the card centre as shown. Stamp the flowers HCPC-3767 Woodsy Wonderland Stamp set in Tuxedo Black ink on white cardstock and die cut using the coordinating die. Colour the lavender with Sweet Plum ink, the daisies with Morocco, Rhubarb Stalk and Bamboo Leaves inks and the other flowers with Canteloupe and Bamboo Leaves ink with the Dove Blender pen. Shape lightly, cut apart and adhere around the bears as shown. Stamp the hollow log from the HCPC-3767 Woodsy Wonderland Stamp set in Tuxedo Black on white cardstock. Sponge with Toffee Crunch ink and Bamboo Leaves ink before die cutting with the coordinating die. Shape and place on the front of the card. Stamp the treehouse image from the HCPC-3798 Happy Times Treehouse Stamp set with Tuxedo Black and colour in with a combination of Bamboo Leaves, Potters Clay, Canteloupe, Sunmer Sky inks with sponge daubers. Die cut with the coordinating die and adhere to the left front of the card in front of the tree trunks as shown. To make the small sunflowers stamp the images from the HCPC-3799 Sunflower Accents Stamp set with Bamboo Leaves ink on the leaves and Morocco ink on the flowers. Sponge the leaves with Bamboo Leaves ink and the flower heads with Tangelo ink and die cut with the coordinating dies. Adhere up the right side as show and on the left of the treehouse. To make the larger sunflowers stamp the images from the HCPC-3626 Classic Sunflower Stamp set in Morocco ink and using the daubers colour in with the Canteloupe ink before die cutting with the coordinating die. Sponge the edges with Morocco ink and shape with flower shaping kit. Assemble with dries clear glue and add the Espress-O Yourself Prills to the centre. Adhere the small flowers to the sunflower stems and the larger sunflowers on the top right corner of the card. To make the leaves on the front, stamp the images from the HCPC-3799 Sunflower Accents Stamp set using Tuxedo Black ink on white cardstock. Sponge the leaves with Canteloupe, Bamboo Leaves and Morocco inks and die cut with the coordinating dies. Shape with the flower shaping kit and adhere around the front of the card as shown.